The basic goal of successful leaders is to build personal and organizational value for themselves and their employees. A successful leader knows he gets “results through people.” To realize his future vision, he builds a results-based culture with enthusiastic, motivated, confident employees working together to achieve the company’s future vision. He wants to embrace opportunity, build sustainability, develop strong employee engagement, become recognized in his industry and community and build value. In short – develop an outstanding organization. Leadership Management Group’s Tom Northup brings more than 30 years of real-world experience, practical expertise, and thoughtful leadership. As the former CEO and principal of three successful businesses, Tom understands the complexities faced by today’s busy executives. 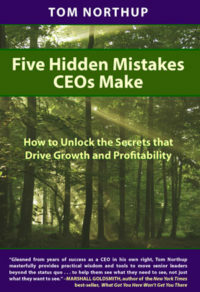 He’s dealt with and overcome the challenges of focusing management teams, fixing productivity and efficiency issues, and creating enthusiastic, can-do cultures so critical to enduring business success. A typical story…. Tom began working with a company not able to maintain growth or profits. Now the company has tripled sales, become strongly profitable, built an outstanding management team and is positioned to double revenue again in the next three years. I invite you to browse this web site for detailed information about how to turn your dreams into performance. Make the leap by focusing on opportunity building an outstanding organization with “unfair” competitive advantage. Start by clicking here the Who We Work With page. Copyright © 2019 Tom Northup. All rights reserved.